This website offers teachers and students an introduction to writing haiku poems, a chance to study the history and nature of haiku poetry and an introduction to the fundamental principles of creative writing. It is free and non-profit making. If you are a teacher, you may download the lesson plans and photocopiable poem sheets and use them with your classes. If you would like to teach yourself how to write haiku, or would like to study haiku, or to learn the most fundamental poetry lesson ever, you are welcome to use the self-study units and the reference section. Master Basho's Spirit is the best introductory lesson for learning quickly what haiku are and for starting to write them. Show Don't Tell is the most fundamental poetry lesson ever, demonstrating the principles of creative writing. These principles apply to screenwriting and the novel as much as to haiku, but because haiku are so short they offer the best way to learn them. 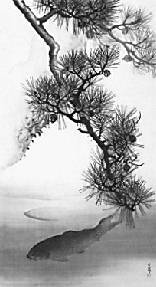 This page provides a short annotated reading list and links to other sites devoted to haiku. Please note that you are free to use poems published on this site with pupils in an educational institution, and for that purpose you may photocopy poems, but the copyright in the poems rests with the authors, translators, or their publishers. You can not re-publish any of these poems without seeking permission from the copyright-holders. David Cobb, Michael Gunton, Cicely Hill, Japan Airlines Foundation (for poems from "Childrens Haiku"), James Norton, Lucien Stryk, Brian Tasker, Weatherhill Incorporated (for the translations of Santoka Taneda by John Stevens), Maggie West, Bill Wyatt, Caroline Gourlay and Jackie Hardy. The teaching lessons on this website have been piloted in schools and colleges many times. They are written by George Marsh, who is the author of Teaching Through Poetry: Writing and the Drafting Process, published by Hodder and Stoughton in 1988. George has taught in schools, and in the teacher training departments and in the literature departments of the University of Portsmouth and University College Chichester. He has also run a poetry development programme in secondary schools for the South Downs College, Hampshire, and was Writer-in-Residence at Kingston Prison and Writer-in-Residence to the centenary of Portsmouth Football Club.